Big cities naturally tend toward entropy, but great cities adapt through great design. Urban culture is all that happens between these two notions. It is what we will explore in one of the world’s most beautiful yet complex cities. ANIMATION BY DESIGN: PARIS 2013 is a three weeks+ CCA/MICA collaborative course that will allow students from all disciplines to investigate key issues of motion temporality as they relate to creativity, animation, design, communications and critical thinking. This course will teach the basics of animation and time-based media with tools ranging from hand drawings to stop-motion, Flash, AfterEffects, motion graphics and newer techniques like Edge. While exploring Paris, the program will challenge students to combine thorough observation and analytical thinking, with creative techniques to represent specific aspects of urban motion. Students will discover world class museums, monuments and urban areas that range from antiquity to 21st century experiments and they will meet exceptional Parisian talents. The course will include the screening and review of relevant works. This course is interdisciplinary, yet it will attempt to nurture each student within their own interest and specialty—graphic design, interaction design, animation, architecture, photography, illustration, etc. As such, the course will help 5D, 4D, 3D and 2D designers to understand how time can reveal the essence of structures, representations, patterns and behaviors. Along this intensive workshop, we will invite all participants to freely explore, experiment, debate, collaborate and above all to reflect on their practice. All transportations and museum visits in Paris done by students will be reimbursed. 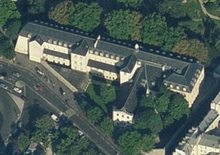 The 17th century Cloitre des Recollets, is a former monastery and now an international research center for artists, designers, architects and scientists. The Center is located in the heart of Paris between the bustling Gare de l’Est and the hip Canal St. Martin neighborhood.Accommodations are in shared lofts with a bed on each level. Each loft includes wifi, bathroom, kitchen, linens and weekly cleanings. The Recollets includes the hip yet affordable restaurant Café A. Students will receive a 20% discount card for the café as well as invitations to all Recollets events. *Accommodations can extend one week beyond the workshop. They are in shared lofts with a bed on each level. Each loft includes wifi, bathroom, kitchen, linens and weekly cleanings.